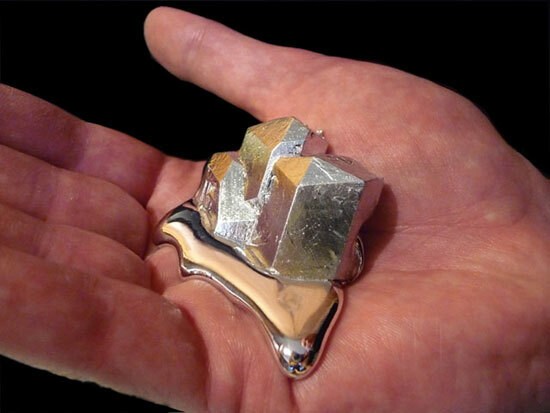 Gallium for Full Moon in Capricorn 7-19-16 – GemPowerment. Reveal your light. Gallium assists with electrical conductivity and Light for transformational events. Greetings my dear Sparkly GemPeople! Many Full Moon Blessings to you! This Full Moon in Capricorn with the Sun in Cancer is a very interesting energy. Coming to Light are all our old ideals about work, institutions, social constructs, goals, and all the “shoulda’s” imposed on us. These are directly opposed to the Cancerian energies around nurturing, home, and emotions. We are here to transmute these seemingly juxtaposed energies into something whole. Of course it will take a while, as we are just in the beginning of the process of what may take generations to fully realize, but how else will we be able to effect this unless we come up with these challenges? What could the result be? Well, maybe Heaven on Earth. How can it get better than that? So let’s throw as much Light and transformative power in there as possible. Guidance is offering the assistance of the elemental metal Gallium (Ga) for this time, which we can work with through the New Moon. Gallium is a non-toxic soft metal from the Boron Group of elements, that is usually found in alloy form. Due to its low melting point (about 84 degrees F, so pure Ga melts in your hand, unless you are a vampire or recently deceased) it is used as a doping metal in semiconductor production which introduces impurities to extremely pure semiconductors to modulate its electric properties. This is also useful in Blu-ray technology, mobile phones, LED’s, solar panels, and brilliant mirrors for technical applications because of its ability to convert electricity to light. Solar panels on the Mars Exploration Rover contained gallium arsenide. Gallium exists natively in trace amounts in the minerals diaspore, sphalerite, germanite, bauxite and coal. It is mainly produced as a by-product of zinc refining. You might be thinking, “Well then, should I just cozy up with my mobile phone or my Blu-ray player for the next two weeks?” You can if you wish, but this is one of those instances where a Quantum connection with the Deva of Gallium is your best bet. As usual you can take a prepared Quartz crystal and ask it to be programmed with the energy of pure Gallium and keep that with you. This is an invitation to meditate with the Deva and ask where this Mineral Ally can help you to move into a new way of thinking or feeling around the Cappy/Cancer issue with Ease and Grace. It would also be helpful to intend with your meditation that this be for the whole planet since some aspect of your answer will work for others. Wishing you Wellness at the Speed of Light and Blessings on your Journey!